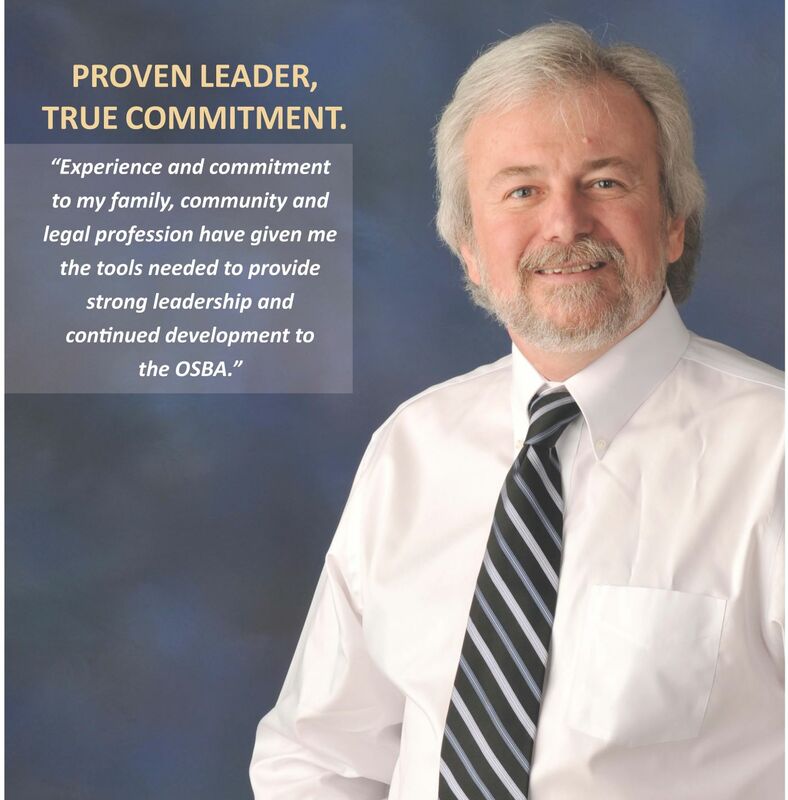 I bring years of leadership experience to the Ohio State Bar Association having served on the Media Law Committee, Council of Delegates for 22 years, the Board of Governors from 2006-2009 (Chair-Budget and Headquarters 2009) and even represented the Association regarding contract issues. I am immediate Past President of the Ohio State Bar Foundation and a Distinguished Life Fellow of that organization and also served on a number of OSBF’s committees. I have been engaged in the private practice of law for over 30 years which gives me a different perspective from that of my opponent. I am a current Shareholder and Immediate Past President of Pickrel, Schaeffer and Ebeling and former Department Chair of the Litigation Team at the firm. I recently became a Trustee of The Dayton Bar Foundation. Having served as a Trustee of the Dayton Bar Association I joined many of its Committees including the former Committee on Professional Ethics, Bar Examination and Qualifications and I am currently a Member of the Certified Grievance Committee, as well as the Fee Dispute Arbitration Panel. I am also a Member of the Montgomery County Common Pleas Court’s Panel of Mediators. My commitment to the legal profession and local non-profit associations is strong. I firmly believe that helping others and giving back to the community are vitally important. I have been very involved with the Kettering Education Foundation serving for 9 years, 6 as President. I was also a member of the Board of YMCA Camp Kern for 15 years and was instrumental is raising funds to help send under privileged children to summer camp. I also was a Trustees of Places Inc. for 16 years, 6 as President. Places Inc. is a non profit organization that provides housing and supportive living to the mentally challenged and chronically homeless. Throughout my adult life I have served and lead many worthy causes. Based upon my experience and dedication, I truly believe I am the most qualified candidate for President-Elect 2019-2020. Click here for more information about Andy Storar.